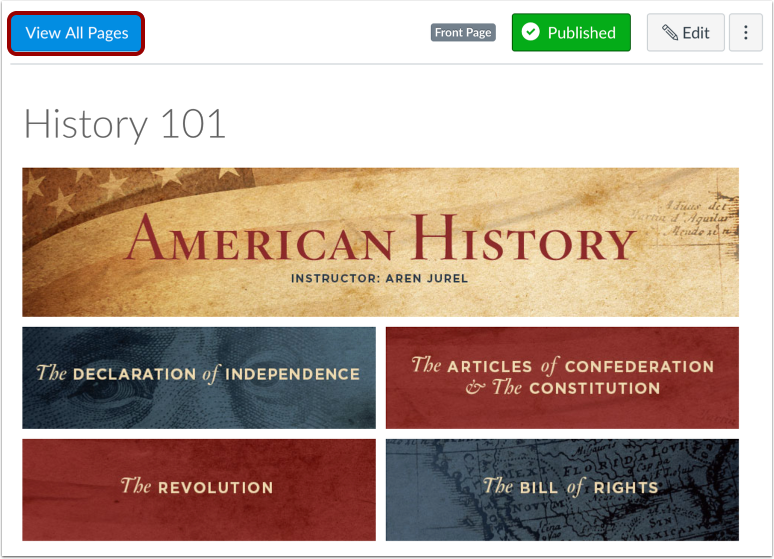 As an instructor, you can create a new page to add to your course. 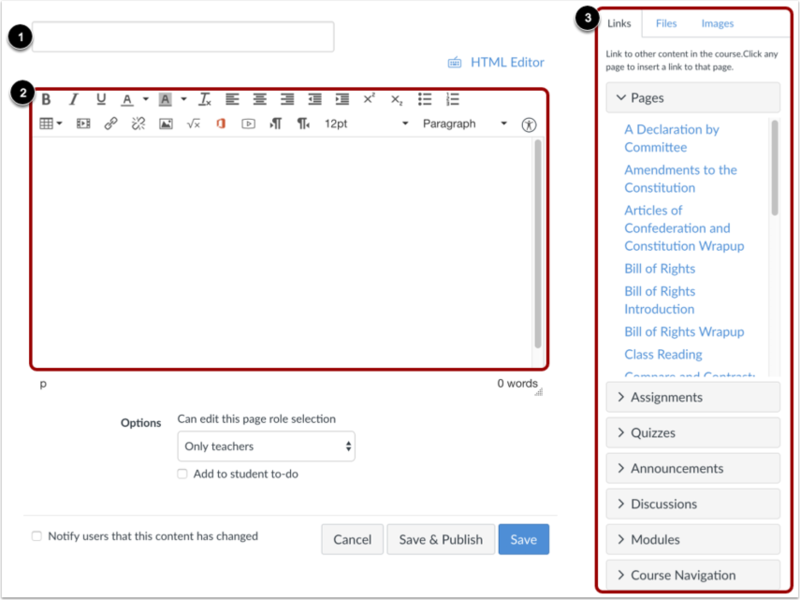 When creating pages, you can set page permissions as to who can edit the page: instructors (teachers), instructors and students, or anyone. You can also add a page to student To Do lists. Pages is designed to open to the front page for the course, if there is a front page selected. To select a page from the Pages Index, click the View All Pages button. Type a name for your page . Use the Rich Content Editor  to create content for your page. The Rich Content Editor includes a word count display below the bottom right corner of the text box. You can also add links, files, and images to the page using the content selector . You can decide who can edit the page by selecting the Who can edit this page drop down menu . Options include only teachers, teachers and students, or anyone. You can add the page to the student to-do list by selecting the Add to student to-do checkbox . When you add a page to the student to-do, the to-do displays in the student's to-do list as well as the in the course calendar and modules. You can also notify users that content has changed by selecting the Notify users that this content has changed checkbox . If you are ready to publish your page, click the Save & Publish button . If you want to create a draft of your page, click the Save button . Note: If you try to navigate away from a page without saving, you will generate a pop-up warning. 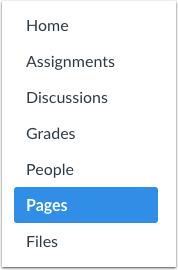 When your page is saved in a draft state, you can return to the page and publish it at any time by clicking the Publish button . The button will change from gray to green . View the page you created. Previous Topic:How do I use Draft State in Pages? Next Topic:How do I change the name of a page in a course? Table of Contents > Pages > How do I create a new page in a course? Re: Content gets REPEATEDLY deleted, implement a "history" feature?